Great theatre drives an audience to a reaction: to yell, to think, to laugh, to cry, and even to scream. It transports the audience, and the performers, to a place far beyond the theater. The Calvert Hall Theatre Department is a vibrant and flourishing program that offers this experience to the young men of Calvert Hall, as well as to talented young ladies from local high schools. The program drives our students to take risks and learn to communicate with honesty, clarity, and passion. Theatre students are trained in all aspects of technical theatre and design, including how to run and manage the sound and light equipment for our state-of-the-art stage and our 1300-seat theater. Each season, they produce and perform two to three full length productions. For more information about the Calvert Hall Theatre program, please contact our theatre Director, Mrs. Kelly Kamp. Inspired by the Newsboys Strike of 1899 and adapted from the 1992 Disney live-action film, Newsies became an unlikely Broadway hit in 2012. Although Newsies is ultimately a work of fiction, the historical strike that took place in July 1899 was every bit as dramatic and major characters found throughout the musical are rooted in historical figures like Kid Blink and Morris Cohen who were the inspiration for Jack Kelly or Nellie Bly who inspired the character Katherine Plumber. 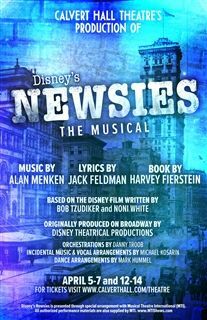 Winning two Tony Awards for Best Choreography and Best Original Score and nominated for a Grammy, Newsies is one of the most popular musicals in America. Based on the true story of the 1899 Newsboys’ Strike, Newsies teaches many lessons about injustice and the need for those in power to recognize the needs of those who suffer and go without. Calvert Hall Theatre has committed to discussing and addressing modern social justice concerns as a part of this production and invite you to participate in our “Seize The Day Challenge”. Our cast will be collecting gently used and new children’s books to donate to a local charity in need. We encourage each family to bring a book with them to donate at the show. As Davey in the show will tell us in Newsies, “Wrongs will be righted, if we’re united – Let us seize the day!” Seize The Day with us in helping children in need. Thank you for your continued support of Calvert Hall College Theatre. Kelly Kamp has served in multiple roles in the Calvert Hall and local theatre community as an assistant director, lighting designer, choreographer, and performer. Mrs. Kamp is a full-time faculty member at Calvert Hall in the Social Studies Department. SEIZE THE STAGE! Take your place as a newsie! Perform with the cast of Calvert Hall’s Newsies! Children ages 6-12 years old will learn the choreography and music to “Seize the Day” and perform it with the full cast along with a live orchestra on the set from the show. Only 30 spots available for this special event. Click here to purchase this unqiue opportunity today.